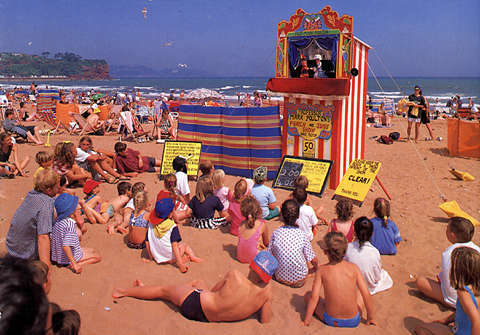 The traditional family holiday always seems to conjure up childhood memories of sitting on the sand next to the donkey rides, swing-boats and pier, with the sound of the sea in the background, the sun blazing down and of course watching the old Punch & Judy Show. Sadly, donkeys are not permitted on a lot of beaches, many of the piers have been demolished but what of the old Punch & Judy Show? 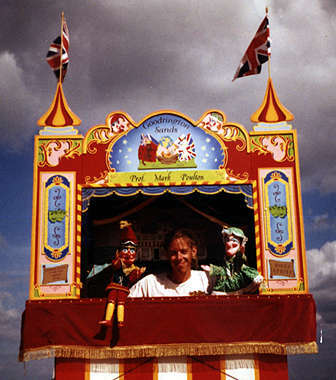 Professor Mark Poulton is one of the last remaining professional seaside showmen still operating in England today. During the summer months he can be found performing from his pitch on Goodrington Sands and also attending various public & private functions. Prof. Poulton has been working full time since May 1989 and has been seen on many different beaches including Llandudno (for the Codman family), Weston-Super-Mare, Lusty Glaze Beach in Newquay, Broadstairs in Kent and of course at Goodrington Sands in Torbay. Mark has also performed at such venues as Tower Hill Pageant, (opposite the Tower of London), Dartington Cider Press Centre, Gloucester Docks, The Riviera Centre, Paignton Childrens Week, Newquay 1900 Week and at the Mayor's Banquet during the Paignton Charter festivities at Paignton Zoo. He also entertains at local holiday parks such as Grange Court and Hill Head. Christmas shows were performed at the Torquay late night shopping nights. Mark also takes part in the puppet festivals at Covent Garden. His show has been featured on numerous T.V. and radio shows such as Disney's Road Hog, The Time The Place and The Pig Attraction as well asthe local news programmes in Devon and Gloucestershire. Every show is the traditional Punch & Judy story with all the favourite characters. However, Professor Poulton tailors each show to suit the age of the audience, the under fives enjoy a slower, more visual show while the older children prefer a slick, fast-moving story-line. There is an educational session with a topic-based talk on all aspects of Punch & Judy from the history (including Victorian England), the sea-side and Puppetry etc. This is followed by a basic show and a question and answer time. There is also a chance for the children to handle the puppets. Prof. Poulton is pleased to visit adult organisations to talk about the profession. Mark designs, builds and paints the shows, puppets and props. He is also a full member of the Punch & Judy fellowship and is one of the 11 members of the Punch & Judy College of Professors. As well as performing the show, Mark also builds booths / puppets for other performers and is a skilled signwriter.